THE LOCATION: Right on one of Maui's best beaches. Napili Bay beach is just outside your door. Located to take advantage of all Napili's restaurants, waters sports, beach and walking/running paths in both Kapalua and Napili. Quality restaurants are within walking distance (the Gazebo, Seahouse and Merriman's a short walk down the beach.) In Kapalua, 1/2 mile away, there is the Pineapple Grill, Sansei Restaurant and Sushi bar, and the Plantation House. You may snorkel with TURTLES in Napili Bay. Rent your snorkel equipment 1 block away at Snorkel Bob's. And rent your stand up paddle board and kayak next door at 808 Boards. We provide boogie boards and beach chairs for you. Enjoy walking or running the coastal path starting just outside of Merriman's a block away and ending at DT Fleming Beach.You can also walk to, Kapalua Beach, Ironwood Beach and Fleming Beach. Walk the village trails of Kapalua with sweeping views of the ocean at Kapalua. If you visit during late December to April 15 be sure to watch the whales right from Napili Bay. See a full whale breach or watch the spinner dolphins play. Be sure to bring your binoculars from home! Or take the Pacific Whale Foundation boat trip out of Lahaina Harbor to see the whales up close and learn of their habitat and migrations. The whales have been coming to Maui for thousands of years to give birth in the shallow offshore waters. Do not miss this opportunity if you are here in Napili Bay in the winter!! Enjoy the night life, shopping and the harbor at Lahaina, a historic whaling port - a short Uber ride away. Quality restaurants there are the Lahaina Grill, Mala's Ocean Tavern, Kimo's. Take a ferry to outlying islands of Lanai and Molokai. Book a spot on a deep fishing charter or a snorkeling boat. Enjoy the shopping on Front St.
For the more adventurous, take a short Uber trip to Kaanapali Beach (Whaler's Village) and sign up for surf lessons, personal watercraft - wave riders, or parasailing! Visit the historic whaling museum located at Whaler's village. Enter into Napili Bay 116 through the modern galley kitchen. Through the kitchen there is a cozy sleeping area with king bed and couch. Here the vibe is modern Hawaii. # 116 has a beautiful oceanview from the lanai and is UNDER A 30 SECOND STROLL to the Napili Bay. Lull yourself to sleep at night to gentle waves of Napili Bay. Enjoy breakfast and coffee on the lanai while enjoying the view of Napili Bay surf. Free Parking is very close and convenient to the unit. The kitchen is well equipped with a Keurig coffee maker, microwave, full oven and pots, plates and flatware to use if you would like to cook any meals. Enjoy dinner with a bottle of wine on the lanai. There are coin-operated washer/dryers on property. We have cable TV with HDTV. OF Course we have hi speed wi-fi. Of Course there is granite throughout. 1. If you do not want to do dishes on your Hawaii vacation - make sure to find a unit with a dishwasher. 2. Make sure to note if you are booking a king or queen bed. 3. You may not want to rent an upstairs unit at the Napili Bay Resort. The upstairs units are considerably warmer. Also lugging your beach gear, boogie boards, snorkeling gear and groceries upstairs is a bit of a pain. 4. Make sure that parking is free and convenient - we have that at Napili Bay Resort (see the pictures). 5. You may want to check if the unit has a remodeled kitchen - Granite is easier to keep clean. 6. Avoid the Napili Bay units with carpet! Book a unit with tile throughout. Having carpet in the unit is undesirable so close to the beach as it is difficult to keep out sand and keep clean. Jim and Gail Scott purchased Napili Bay in January of 2004. We are happy, when you are happy and we love to help you with your vacation and hear from you afterwards. Our goal is for you to have a perfect vacation! The Napili Bay Resortit is quaint and small and away from the commercialized areas such as Kihei. The complex itself sits right on the sand. ******Things to consider when booking your Napili Bay condo****** 1. If you do not want to do dishes on your Hawaii vacation - make sure to book a unit with a dishwasher. 2. You may want to consider bed size (queen or king). 3. You may not want to rent an upstairs unit at the Napili Bay as there is no air-conditioning at the Napili Bay Resort and the upstairs units are considerably warmer. Also lugging your beach gear, boogie boards, snorkeling gear and groceries upstairs is a bit of a pain - Stay in a downstairs unit! 4. Make sure that parking is free and convenient. 5. You may want to check if the unit has a remodeled kitchen - Granite is easy to keep clean. 6. You want to get a unit that has porcelain tile throughout. You are very close to the beach Napili Bay Resort and a unit with carpet is undesirable so close to the beach as it is difficult to keep out sand and keep clean. outdoor shower, Two outdoor showers for washing sand off. Near beach gates. toilet, shower, Tile shower with turtle decos. Stationary glass enclosure. New updated shower with 20X20 tile. Turtle decos with a stationary glass enclosure. We have a beautiful view from our lanai to the ocean. Please see the pictures that are a view from the lanai. Linens are provided at check in. If you have a longer stay, they can be washed at the coin operated washer and dryer. All new sateen 400 or 600 thread count sheets. Our laundry kiosk which is a short walk away provides on site coin operated washers $1.50 per load. We provide, sheets and towels. We provide 2 regular towels, 2 and towels, and 2 wash clothes per guest. Our dishwasher is a Kenmore brand. It is a noise mitigating model just in case you only remember to start it right before you go to bed! We installed a brand new refrigerator in 2018. Adequate size for groceries, sodas and beer. Whatever your beach needs and meal needs this refrigerator will store it! Don't eat out at night! We have a full size oven so you can prepare meals in your condo. We do have a microwave with basically all the bells and whistles. We have a keurig and a regular coffee maker. We have a two slot toaster wide enough for bagels. We keep some of the basic items, like salt and pepper. Usually olive oil can be found as well. We have plate settings and silverware for four. Our kitchen was remodeled with new cabinets, new appliances, and granite countertops in 2005. We have a well stocked kitchen. Another note: we have a commercial ice maker in the laundry area. We have a dinning table that seats 3 on our lanai. We also have a table for 2 inside the studio. Brand new 42 inch flat panel LCD TV. 32 channels of cable TV. There is a "beach book" exchange library in the laundry kiosk. Our lanai open up to a beachside garden area. Very quaint and private. 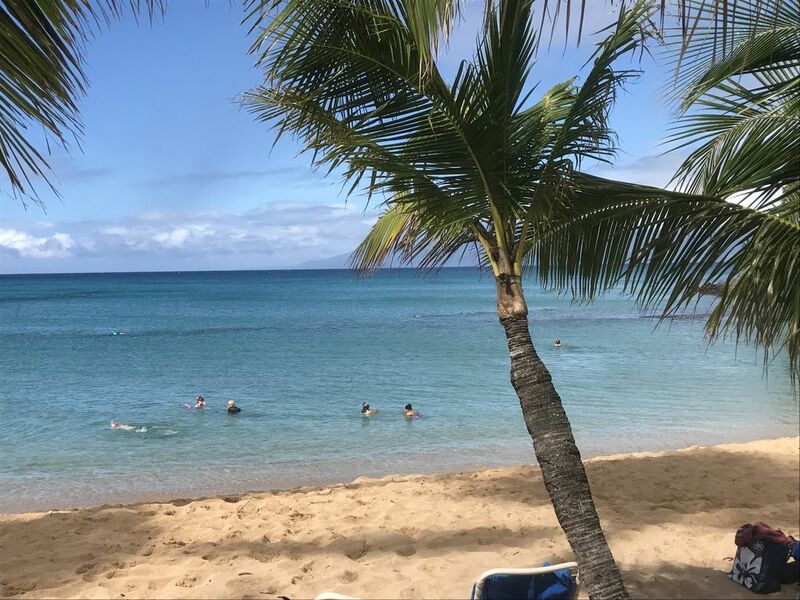 There is a boat harbor 8 miles away at Lahaina Harbor: fishing boats, snorkel cruises, sunset sails, whale watches (Dec. thru early May) you can even go over to Lanai on the ferry and play golf! Nice walk-out lanai with seating on it and an oceanview. See the pictures on this listing. Have coffee in the morning or wine in the evening or your private lanai. Steps from the ocean! Snorkeling gear, stand up paddle boards, and surfboards can be rented 1/2 block away at 808 boards. See pictures in this listing. Tennis is available 1/4 mile away in Kapalua. There are also tennis courts available at the Royal Lahaina in Kaanapali. World famous Kapalua Plantation and Kapalua Bay Courses -1/4 mi. Kapalua Golf academy 1/4 mile away.. Royal Kaanapali Golf Course - 8 miles south of Napili. There are 32 courses on the island! My wife and I had a great week at James Scott's Napili Bay #116 downstairs condo apartment, literally a few steps from beautiful Napili Beach in northwest Maui. The unit was cozy but comfortable for two. Great small patio for breakfasts, and private access to the beach - really great for morning swim before 8:30 am! Especially appreciated the nearby laundromat and barbecue, beach chairs, day coolers, sand mat and umbrella. Walls are a little thin, can hear upstairs feet and across the way Napili Surf parties, but usually very quiet after 11:00 pm. Easy drive or walk to nearby gorgeous Kapalua Beach, and convenient drive to Kanapali and Lahaina for shops, restaurants and dive boats. We visited in late March and early April, so ceiling fans were adequate at that time for cooling at night. Appreciated the comfortable king size bed. A little difficult opening and remounting the old entry key lock box. But owner Jim Scott was very prompt via email to help us out with that, as well as reminding us of the room's wifi code. Wifi can be very spotty in that location if that is important to you. Short walking distance to a great restaurant the Sea House for breakfast or dinner. Great views. And short drive or walk to Snorkel Bobs for inexpensive snorkel gear, wet suit, and boat trip reservations. Aloha! Aloha Rex! Jim and I are so happy you had an awesome stay. I can tell from your brief comments the nice clean condo and our beautiful bay were appreciated. We can't wait to have you back again soon to share our Maui home. Wishing you and your family all the best in life. Nice studio on beautiful beach property. We stayed at this condo for 4 days, and thoroughly enjoyed the easy access to Napili Bay. We snorkeled every morning and went back for an evening swim to watch the sunset. Not having to pack your car full of things you might need and driving to the beach was very convenient. The condo came with the essential supplies as well as some beach items that aren’t usually provided. The hosts were very responsive when unexpected construction began on the floor above. Our hosts and others in the complex were not notified of this planned upcoming construction so it’s no fault of theirs. Jim and Gail went out of their way to find a solution that worked for us even though this was not their fault. We would definitely stay here again on a repeat visit. The condo, itself, was average. It was pretty clean, had some of the essentials, and had a great patio with a view(ish) of the beach. No air conditioning made it a little hard to sleep at night but the fans and open shutters did ok to keep it cool. But, who cares? You’re in Maui, you don’t spend time in the condo, you go to the beach and Napili Bay is absolutely gorgeous! Great snorkeling, great body surfing, and great sand! Sea House Restaurant is steps from the beach and has a really good happy hour menu! This condo was perfect for me and my wife but we will need something bigger for when we return with the kids in a couple years. Thank you for the four star review. I'm glad you found our unit clean and "that it was perfect for you and your wife". We also love having our morning coffee on the lanai and watching and listening to the waves roll in. From your description it sounds like you took full advantage of our "fabulous" location right on Napili Bay Beach. "Great snorkeling, great body surfing, and great sand!" You can't you can't get better than that. We enjoyed our stay at The Napili Bay, unit #116. The location was perfect with our favorite beach just footsteps away. Owners Gail and Jim were gracious and helpful hosts. The unit is a studio, nicely decorated, clean and has all the amenities you need, including boogie boards, beach chairs, beach towels and snorkel gear. The only downside was the lack of air conditioning. It wasn't bad during the first part of June and the fans and trade winds were wonderful, but AC would help make it more refreshing after a day at the beach. Merriman's and the Sea House are right down the street and have great food and views! Everything is there to make for a perfect vacation! Thank you for your kind review. We are so happy that we were able to deliver the 5 star service and experience that our guests deserve! It is true that Jim and I work hard to be gracious hosts. It was a pleasure having you as our guests and look forward to seeing you again at "the perfect location" at Napili Bay 116!. Maui No Ka Oi ! Jim and Gail, owners. Unit sleeps a max. of 2 people.